The former Fujino Town in Sagamihara City in northwestern Kanagawa Prefecture is a peaceful town with a population of about 10,000 people. Located in a valley surrounded by abundant nature with mountains and lakes in spite that it is only one hour away from central Tokyo, it is known as an artists' town, promoting and displaying art works around town. What is the Transition Town movement? It is concept to apply the theory of permaculture to municipal revitalization. The idea for permaculture originated in Australia, and is a practical approach to designing a lifestyle that will create sustainable human environments. The word "permaculture" comes from the combination of "permanent" and "agriculture," later expanded to signify "culture." The first Transition Town was initiated in the fall of 2005 by Rob Hopkins, a permaculture teacher in Totnes, a small town in England. Supporters promoted the movement across England and all over the world. As of July 2012, there are Transition Towns in 900 municipalities around the world; if municipalities preparing for transition are included, this doubles the number to 1,800. As the name implies, Transition Towns are embarked on a "shift." This is a grassroots movement that recognizes our present crisis, symbolized by peak oil and climate change, and aims to achieve a shift in the community towards sustainability by optimizing the use of existing local resources and the skills and creativity of local people. The Transition Movement in Japan started in three areas; Fujino and Hayama in Kanagawa Prefecture and Koganei in Tokyo. This took place starting in fall of 2008 after a group of people who got to know each other at a permaculture school in Kanagawa Prefecture launched a organization called Transition Japan in June 2008. As of July 2012, there are 32 active Transition Towns in various regions of Japan. Transition Fujino was established in the fall of 2008. The organization started with a movement to share the issues through events including briefings and film presentations. Then a local currency, the "Yorozuya" (meaning "general store" in Japanese), was launched and played a major role in promoting local networking. The Yorozuya local currency movement started with 15 members in 2009, two years after Transition Fujino was established. As of 2012, 150 households participate in this network. People can exchange goods and eat at restaurants using the Yorozuya. The network continues to thrive by stimulating local needs, such as providing pet care, weeding vegetable gardens, picking up children, and connecting the those in need with those who can give a hand (local human resources). People wouldn't normally pay for such services, but they do find it helpful if someone gives a hand. During the Great East Japan Earthquake in 2011, the network displayed a great ability to support disaster-affected areas by collecting cash donations, gathering and sorting emergency relief supplies, and regularly holding charity events. Various working groups were launched to utilize the Yorozuya network. 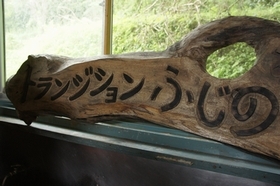 Unique working groups include the "Moribu" (forest department in Japanese), which tackles satoyama conservation through tree plantation thinning and the "Ohyakusho (farmers) Club," which aims to increase the food self-sufficiency rate, focusing on grains. Now, four years after the launch of Transition Fujino, local people are voluntarily engaging in each of their areas of interest. Transition Towns in Japan identify themselves with the initials "TT," which also stand for the Japanese words "Tanoshiku and Tsunagaru," which mean "having fun" and "networking." True to these bywords, people involved in Transition Fujino work for local independence while making it a point to enjoy their lives and avoid overworking. An independent, secure and happy way of life finds support in the warm connections between local people nurtured by the Transition Town movement. After the Great East Japan Earthquake in March 2011 and the accident at the Fukushima Daiichi Nuclear Power Plant, many Japanese people have begun to think about the origins of the electricity they have been purchasing from power utilities and other aspects of energy issues that they had been ignoring until then. Before 3.11, all-electric homes were popular as being convenient and economical. However, the blackout after the earthquake completely stopped everything that normally powered everyday life and many people suffered greatly because everything in their homes depended on electricity. Partly because of this problem, many people recognized the importance of energy self sufficiency and diversity and started to take an interest in systems that can generate electricity at home, such as solar power, and in electric cars in their role as a back-up power supply. In the wake of the 3.11 incident, the working group "Fujino Denryoku" ( "denryoku" meaning "electric power") was established in 2011. It aims to help people break away from their dependence on electricity provided by the traditional power utilities that they had taken for granted, and try to make a transition towards self-sufficient, locally-distributed energy created with the participation of local people. The group's first project was to supply power for lighting and sound systems at a local festival. Project teams also went out to festivals in the earthquake disaster zones in the Tohoku region, and offered support to the affected area by supplying power generated with renewable energy. 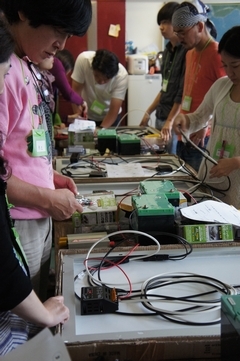 The working group also holds monthly "Solar Power System Workshops," where participants including beginners can easily assemble a home system by connecting PV panels and batteries, etc., under the slogan of "An Energy Shift Starting at Home." The first workshop was in December 2011. Participants initially learned from one another, but the workshop began to attract attention from a wider public, and within six months it was being introduced on TV and in magazines. Not only local residents but people from outside the town have increasingly come and joined in the workshop. These workshops take place in a classroom of an abandoned elementary school, the former Makisato Elementary School, which serves as an activity base for Transition Fujino. The scene is of a variety of people, such as parents and children, married couples, young couples and young ladies participating in the workshop along with observers. The small classroom is filled with 10 sub-groups each assembling a PV system with the help of staff members who explain the process, and over a dozen observers. The assembly procedure is so easy that even children can do it. However, if it is assembled in the wrong order, it may short out and be dangerous. Thus workshop is exciting and participants listen intensely to the explanation while observers ask questions and take pictures. It takes two or three hours to complete the assembly. 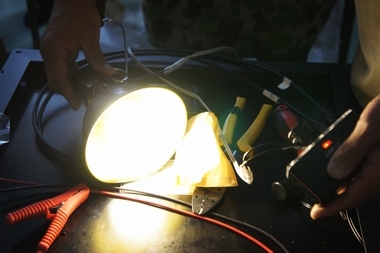 When participants connect lights to their hand-made power generators and lights come on, there's a lot of applause. The fee for participating the workshop is 42,800 yen (about U.S.$542), which includes the standard assembly kit. One participant said, "If I bought the necessary materials on my own, the cost would be about the same. I decided to join because I can learn how to assemble the system for the price of the materials." An average monthly salary in Tokyo is about 240,000 yen (about U.S.$3,038) excluding tax, so the solar power generator costs only about 20% of a single month's salary. The standard kit utilizes a 50 watt PV panel. Many participants use this system for charging their mobile computers and cellphones. For a 50 watt notebook computer, the system can provide power for four to six hours by charging it during the day. As of the end of July 2012, the accumulated output of all the solar power generators assembled at the workshop amounted to over 10,000 watts. At local festivals and events, organizers ask past workshop participants to bring their systems to contribute to the electric supply for livening up the events. Fujino Denryoku is also engaged in installing solar power generators for newly constructed residential homes in the area. As of July 2012, they equipped three houses with solar systems. The cost of each installment was about 80,000 yen (about U.S.$1,013) for a 50 watt PV panel, and about 150,000 yen (about U.S.$1,899) for a 100 watt PV panel. Although the system does not suffice for all the electricity needed, it can reduce dependency on the power utility. To enhance energy independence means to have a "lifeline backup," enhancing security. Other projects are also underway. 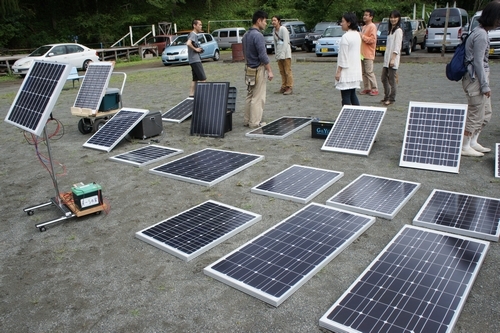 In May 2012, the group received 170 old PV panels from a university professor acquainted with the group. Fujino Denryoku is attempting to use these panels to provide all the energy needs for their base at the abandoned elementary school, while charging electric vehicles with the surplus. It also aims to improve energy self-sufficiency by utilizing local resources other than solar power, such as small-scale hydro power and wind power. Not only energy, but in all corners of our lives, an increase in local self-sufficiency and an uncoupling from our dependency on the global system can enhance local resilience and help us to cope firmly with large scale contingencies such as earthquakes and other crises. Transition Fujino is helping increase local independence through their activities using the community's interpersonal bonds, resources and manpower. The Transition Movement helps develop independent sustainable communities by using local resources, traditions and culture. Thus the form of their activities varies from community to community. In Japan, as of July 2012, one transition town emerges every week, if we include those at the preparatory stage. Unique transition towns like Fujino will soon be born all over Japan. We are looking forward to following the future of Transition Towns.